When you got to Miami on vacation you’re most likely looking to spend some, if not all, of your time on the beach, so why not stay right on the beach? The Ritz Carlton South Beach Hotel is located right on Miami’s most famous beach, and conveniently it is just steps away from Lincoln Road shopping, one of the best open air promenade shopping destinations in the country. This luxury hotel caters to some of the richest and most elite clientele in the world so you never know who you’re going to be rubbing elbows with. The Ritz Carlton, South Beach features 375 guest rooms with two poolside lanai wings. The location can’t be beat as the Ritz-Carlton is easily within walking distance to Ocean Drive and its chic architecturally designed stores, restaurants and homes, Lincoln Road and its incredible stores, restaurants and people watching venues, the always hip South Beach nightlife and, of course, South Beach. Relax in style at the hotel by taking advantage of the 16,000 square foot Ritz Carlton Spa. And for those who wish to combine their luxury with a little business, there are more than 20,000 square feet of meeting and conference facilities for business or for anyone who wants to host an exceptional event at the hotel. 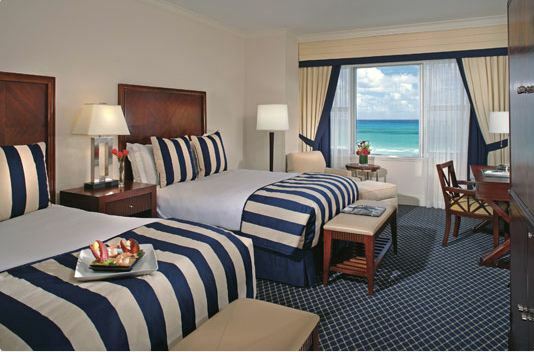 Each room is between 400 and 450 square feet with views of the Atlantic Ocean, the pool and South Beach. There are iPod docking stations complete with AM/FM clock radios, an in-room laptop compatible safe, computer and fax hookups, goose down and nonallergenic bedding options and 100% cotton linens, incredible marble baths and mini bars. The attractions at The Ritz Carlton, South Beach are basically the same as they are for every hotel in the Miami area, the beach and the South Beach scene. Miami’s Beaches are each a little bit different and draw a different crowd, learn a bit about the beaches before you decide to spend a day at one. If you’re inclined to spend more time in the hotel make sure you take advantage of The Signature Shop with products that are distinctly Ritzy in nature, the two restaurants, one restaurant for a quick meal on the oceanfront and another fine dining establishment indoors, the elevated pool with its view of the ocean and comfortable day beds, the $2 million original art collection featuring some known and many emerging artists. And if you’re interested, there are limousines available and personal shoppers. The spa at The Ritz Carlton is something you really need to experience with its 16,000 square feet, the 14 treatment rooms, luxurious relaxation lounges, two couples’ suites, a full service salon and exceptional service. The spa has topped Allure magazine’s A-List as the Best Day Spa in Miami and is a favorite among guests and locals alike. Miami has a certain reputation for its incredible nightlife and guests at Ritz Carlton Hotel are located smack dab in the center of one of the most happening areas of the city. If you’re up for a stroll you can wander over to the South Beach area and walk from party to party, hitting several clubs along the way. The strip turns into a non-stop party at night and streams of people move from club to club.